The Clippers’ offseason gets off to a wild start. It’s fun to follow the story of the Clippers because Doc Rivers is a very good storyteller. As the franchise tries to finally escape the shadow of its former owner and wash away the taste of its recent playoffs collapse, it is undertaking a massive marketing campaign — essentially relaunching the franchise in the Steve Ballmer era. The Clippers are changing their players, their uniforms, and their logo in an attempt to change the perception of them as a team. In that sense, they have the perfect coach. Rivers is a master communicator and a master motivator. He is radically transparent, especially compared to the one-word Belichick-isms sports fans are usually confronted with. He is a great avatar for the franchise. Whether they have the perfect front office is another question. The problem with that question is that their president of basketball operations is also Doc Rivers. Earlier this week, Rivers made the biggest Clippers transaction since the Redick-Bledsoe-Dudley blockbuster that jump-started his tenure with the franchise, dealing Matt Barnes and Spencer Hawes to Charlotte for Lance Stephenson. When Rivers trades for his son, or signs Jordan Farmar and then cuts him, or signs Hawes and then benches him in the postseason and deals him in the offseason, it’s pretty funny. GM Doc gonna GM Doc. When he starts talking about why he made those deals, or any of the transactions he’s made, or any of the transactions he’s avoided making, or all the work he had to do to even get the Clippers to where they are, that’s where things get interesting. I wonder if Chris Paul and Blake Griffin know they are part of a rebuilding project. Forget all that Lob City leaping you might have seen over the last two seasons; the Clippers are still learning to walk. As Rivers attempts to reconstruct this roster — deals for Paul Pierce and Wilson Chandler are reportedly being pursued, and everything is still hinging on DeAndre Jordan’s impending free agency — he is making sure we are all aware where we are on the timeline. 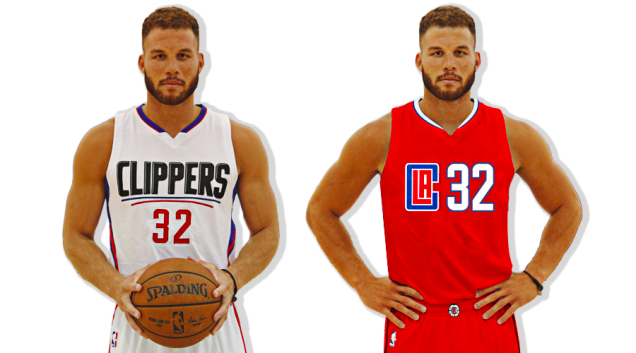 This all dovetails quite nicely with the franchise face-lift the Clippers are getting. Just look at the new uniforms. A couple of months ago, Chris Erskine wrote a column in the Los Angeles Times comparing the Clippers to the Cubs. He was talking about the bad luck the team had experienced on the court, but by the looks of the new red away uniforms, he was really onto something. You’d think the Clippers would be wise enough to not invoke a cursed franchise like the Cubbies, but when you look at the new threads, it kind of makes sense. This is a team that needs a new identity as much as it needs a new bench. The Cubs might be cursed, but they are lovable. For the last couple of seasons, the Clippers have been the bad guys. Whatever sympathy the players engendered for suffering through the final days of the Sterling era was lost over the past nine months as they developed a reputation for being the biggest group of babies in the league. When you thought of the team, you no longer imagined Jordan diving into the lane for an above-the-rim alley-oop. Instead, Paul was throwing a moody. When the Clippers dropped three straight games in the Western Conference semis, most neutral fans snickered. This wasn’t heartbreak. It was kind of funny. The salary cap will dictate what the Clippers can do in terms of personnel. But there are no limits on how far they can go to make themselves more liked. The uniforms are a start — a clean break from the Sterling era — and the self-effacing viral video that accompanied their release (and the somewhat lukewarm response) made strides to show the franchise as self-aware and relatable. This is part of what NBA teams do now; they tell a story. For years, the Clippers were the plaything of an evil man. Now they belong to an ebullient billionaire and are being run by one of the most respected minds in the game. And together, they are going to tell us a different story, and they are going to try to make us forget about Jordan at the free throw line, no matter how many interviews it takes, no matter how many new narratives have to be fashioned, no matter how many public appearances need to be made. Yesterday, Ballmer went to the Sprinkles cupcake shop to hand out new shirts to fans. Rivers made an appearance at Pink’s Hot Dogs. Cupcakes and hot dogs. Welcome to the Clippers’ family barbecue.